Notify drivers of permitted parking spaces in lots, garages, or on side streets with permit parking signs. Whether a simple reminder in green and white or a bold warning in red and white is needed, permit parking only signs clearly identify certain spaces are reserved for parking permit holders. 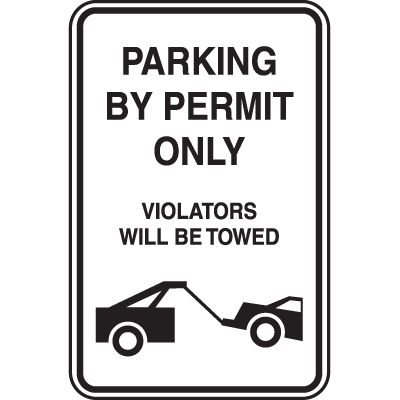 Our permit parking signs come in aluminum and durable plastic in several styles, including Permit Parking Only, Permit Parking Violators Will Be Towed, Vehicles Without Valid Parking Permit (With Graphic) signs, and also a Parking Permit Log Book. To protect signs from fading and graffiti, add Seton UltraTuff™ Overlaminate Protection with a lifetime guarantee. Ensure only permitted vehicles park in spaces reserved for authorized permit holders with permit parking only signs.